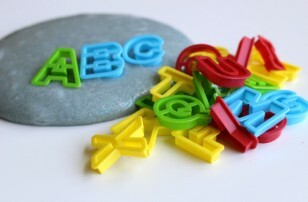 We have been doing so many playdough and other sensory activities lately that it was about time to get back to a simple and playful alphabet activity. 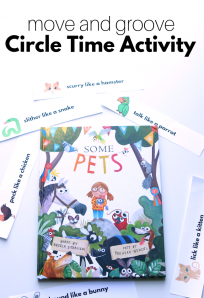 This alphabet activity is part of our Alphabet For Starters series. This series is all about playing with letters, discovering them without pressure. 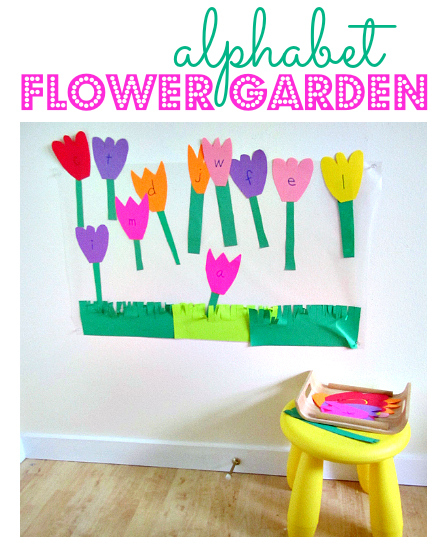 This alphabet garden is super simple but can be made more challenging with a few simple changes. Gather your materials. You will need some contact paper (rumor has it that the dollar store is carrying it now! 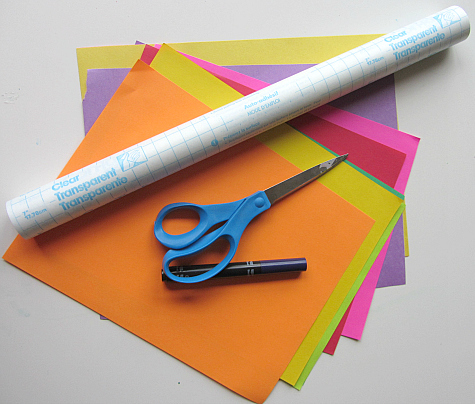 ), some green construction paper, multi-color construction paper, scissor and a marker or two. 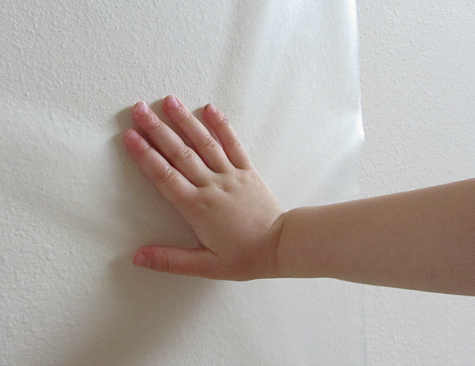 Attach the contact paper to the wall sticky side out. She loves to “get stuck” on the wall. Next step is making some grass. 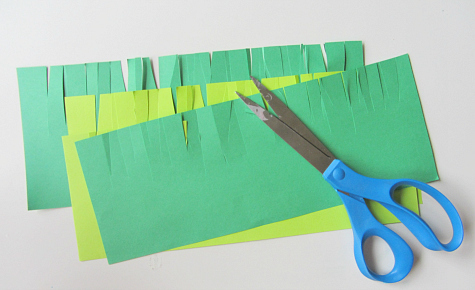 Fold your green paper, and cut. Next cut some stems and flowers. I did tulips because they are easy to free hand cut. Add letters to your flowers. Now here is where you can easily customize this activity. For my daughter, I did plain old lowercase letters. 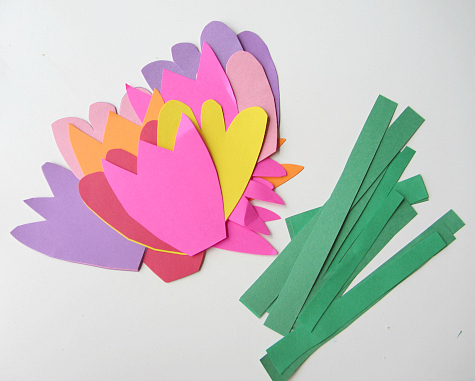 You can do upper or a mix or write letters on the stems and have it turn into a match game. 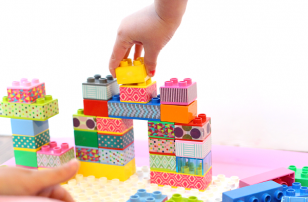 Set the pieces out and let your kiddo explore. My daughter loves flowers and she got right into it. 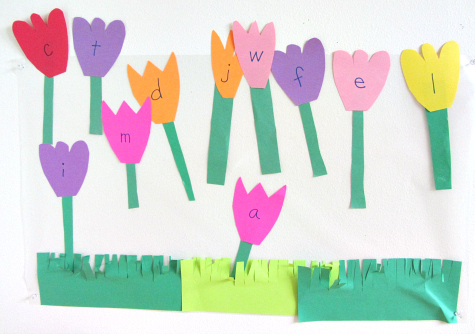 We talked about the letters, the colors of the flowers and how the stems are different lengths. Don’t pressure young kids to do every letter. My daughter put a handful on while we played the first time. Then I left it all setup and a few days letter she returned and added a few more. I will leave it up for a few more days and I am sure she will keep adding a few every day. 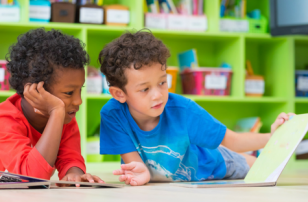 The whole point is to play and discover letters. 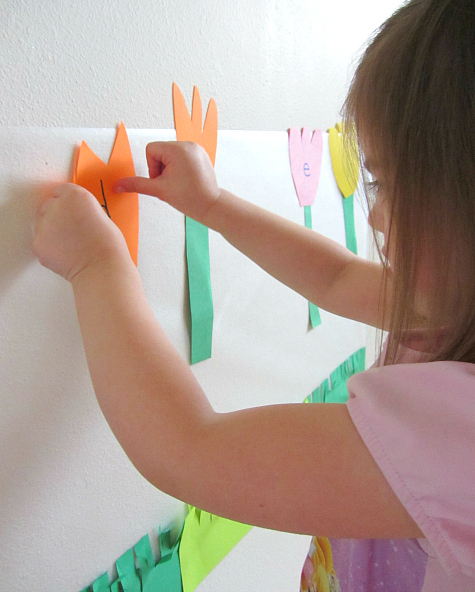 As she adds the letters to the wall she naturally says “Look this is A, it’s your letter Mama!” and we talk about it. If you are looking for a more traditional letter of the week approach we have many letters of the week ideas here. 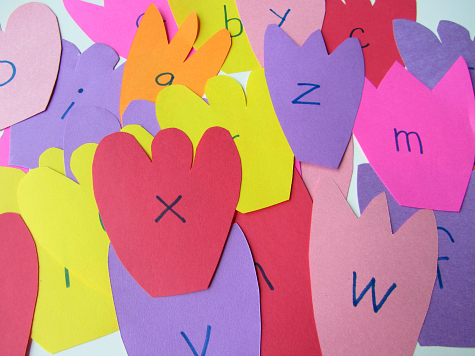 My son loved cutting and pasting so we made fun letter crafts when he was learning his letters. 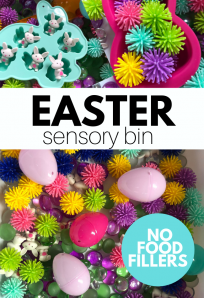 Find what works best for your child, what they enjoy and don’t forget to have fun! 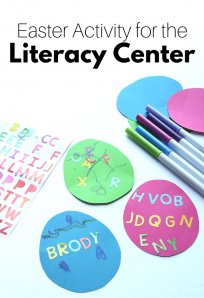 For more fun Alphabet activity ideas, make sure to follow me on Facebook! 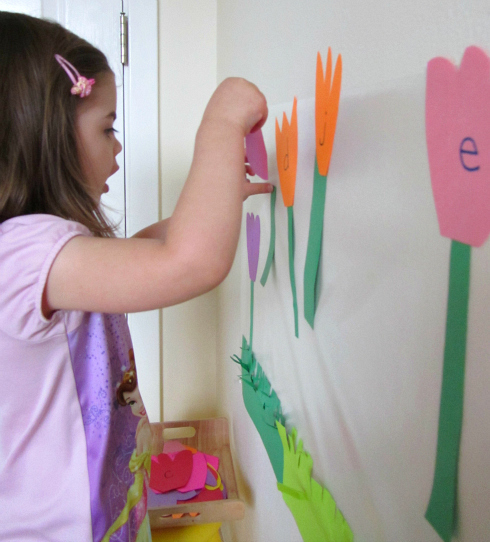 I did something similiar to this but used the sight words that my older daughter was learning at the time. Where did you get the contact paper from? I asked in target and they had no idea what it was? Is it the same thing as you use in kitchen to line the shelves? Thanks! Walmart and yes they are in the same section as those contact papers . Just look for the clear one. Allison, My son loves buses and trucks. 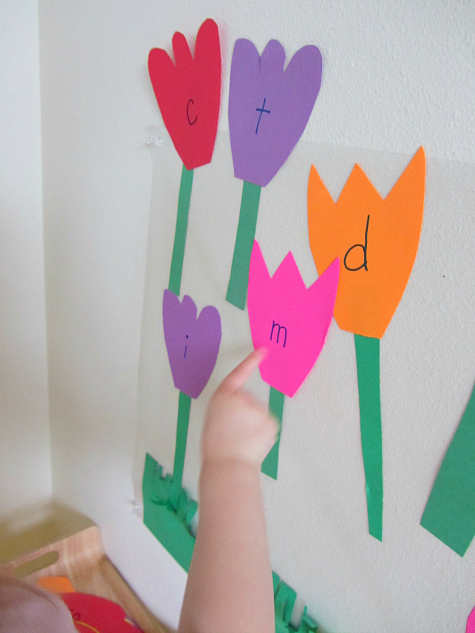 I want to teach him lowercase using similar idea as you have done with flowers here. Do you have any ideas to make it interesting? 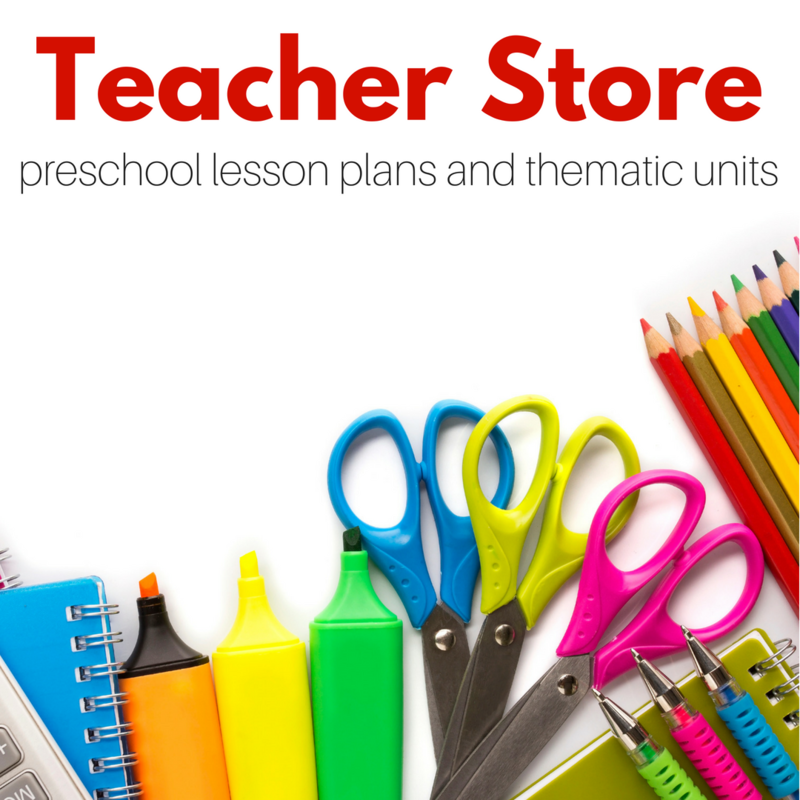 I refer to your site everyday to help me plan activities for my 2 yr old. Thanks for your wonderful posts. My daughter is totally into trucks and construction vehicles too . I am going to do something with her tomorrow and blog about it early next week. Hold tight if you can I am excited ! My 2 1/2 year old daughter LOVED this project! We kept it on the wall because we liked to look at it. So a few days later I had the idea to create alphabet bumble bees to match up with our flowers. We completed all 26 letters without even coming up for air. I love extending the learning lesson this way. I may even take all the bumble bees down and have her “play” again in a few weeks. Thanks so much for all your ideas. My daughter has really flourished since following your blog! That sounds so cute and what a fun way to keep the momentum going! Thank you so much for the kind words it really really means so much! 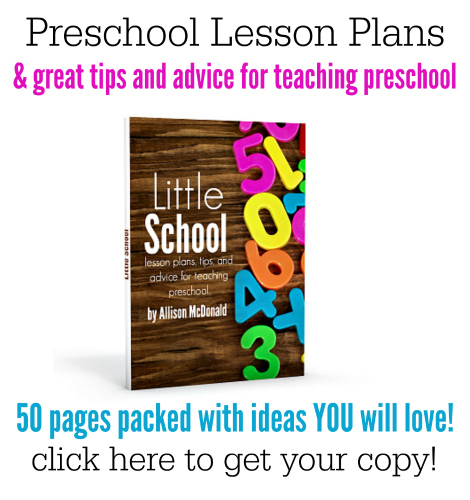 I love these alphabet activities! Where can I find wrapping paper with cars and trucks? I got mine at Target in the kiddie birthday aisle. So cute for spring! I made a bulletin board for my preschool Sunday school class based on this idea. Thanks!